Conjunctivitis is a highly contagious disease which occurs world wide both sporadically and epidemically. Most varieties of conjunctivitis are self limited, but some may progress and cause severe ocular and extra ocular complication. Even in self limited conditions, it causes a significant period of ocular morbidity and loss of work place efficiency. It affects all ages and all social strata. Approximately 2% of all primary case visit and 1% of all emergency room visit are related to conjunctivitis. Appropriate prevention strategies are required to prevent this condition to spread and affect large number of people. Conjunctivitis is a general term that refers to a diverse group of disorder, characterized by inflammation of the conjunctiva, as typified by congestion, pain, discharge, lid edema and gritty sensation of the eye. Conjunctivitis is considered extremely common in developing countries. Although there are no reliable figures that document the incidence or prevalence of conjunctivitis, this condition has been cited as one of the most frequent causes of patient self-referral. Adenoviral conjunctivitis is the most common cause of epidemic conjunctivitis accounting for 70% . It is highly seasonal, often following monsoons. It often assumes epidemic proportions in certain years. The morbidity is directly linked to the virulence of the infecting virus. Rarely, chlamydia is the causative organism in 2% of cases of acute conjunctivitis and is the most common cause of chronic follicular conjunctivitis. Ophthalmia neonatorum, which denotes purulent conjunctivitis caused by gonococcus in infants, is a relatively rare phenomenon nowadays. Conjunctivitis is a general term that refers to a diverse group of disorder, classified as infectious and non infectious affecting the conjunctiva primarily. The cause of infectious conjunctivitis include viral and bacterial while noninfectious conjunctivitis are allergic,mechanical/toxic/irritative,immune mediated, and neoplastic. 5. Masquerade syndromes like ocular squamous surface neoplasia, ocular cicatricial pemphigoid. The ophthalmologist plays a critical role in breaking the chain of transmission of epidemic conjunctivitis, primarily by educating the patient and family about proper hygiene. Infected individuals should be counseled to wash hands frequently along with washing their eyes and use separate towels, and to avoid close contact with other family members during the period of contagion. Health care facilities have occasionally been associated with epidemic outbreaks of adenoviral keratoconjunctivitis. Paradoxically, eye hospitals may be a source of the disease transmission and hence steps have to be taken to prevent such instances from happening. Hand-washing procedures with antimicrobial soap and water and disinfecting ophthalmic equipments in between every procedure may reduce the risk of transmission of viral infection. Exposed surfaces on equipment like the applanation tonometers can be decontaminated by wiping with sodium hypochlorite (a 1:10 dilution of household bleach] or with 70% isopropyl alcohol. Prevention of allergic conjunctivitis is possible by changing the environment of the patient or by avoiding exposure to allergen causing the allergy e.g., pollen, animal fur. Ophthalmia neonatorum can be prevented by prenatal screening and treatment of the expectant mother suffering from sexually transmitted diseases and prophylactic treatment of the infant at birth by using 0.5% erythromycin or 1% tetracycline ointment . History taking, comprehensive evaluation of the eye and understanding of the general epidemic prevalence of this condition in the society is crucial to establish a diagnosis . Patients usually come with typical history of matting of eye lashes on waking, copious purulent discharge, redness, gritty foreign body sensation, itching and rarely may even present with distortion of vision, photophobia and coloured haloes. Examination: The ocular examination includes recording visual acuity, an external eye examination and slit-lamp biomicroscopy. Visual acuity measurement: Due to acute infection of the involved eye, it is difficult to record visual acuity accurately. Although visual acuity is normal in patients with conjunctivitis, discharge sliding across the eye may cause visual disturbance vision colored haloes resulting in under estimation of true visual potential. 1. Abnormalities of skin like signs of eczema, roseacea, seborrhea. 2. Look for regional enlargement of lymph nodes (pre auricular). 3. Abnormalities of eye lid and adnexa like swelling, ulceration and discolouration and laxity. 4. Examination of conjunctiva to look for chemosis, sub conjunctival hemorrhage, discharge cicatricial changes and symblepharon. 1. Eye lid margins: To look for inflammation, ulceration, nodules, vesicles and keratinization. 2. Eye lashes: loss of eye lashes, crusting, scurf, nits and lice. 4. Tarsal and forniceal conjunctiva for presence and size of papillae and follicles, membranes, pseudo membranes, ulceration, masses, hemorrhages and cicatricial changes like foreshortening and symblepharon. 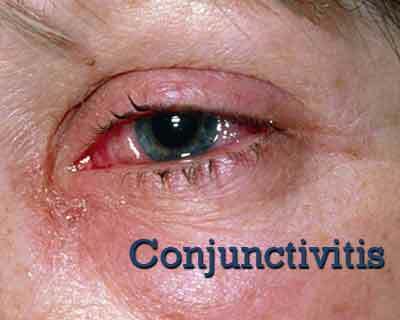 Specific helpful clues in differentiating the causes of conjunctivitis are listed below. o Preauricular adenopathy sometimes occurs; chemosis (thickened, boggy conjunctiva) is common. o Discharge is copious; discharge quality is thick and purulent. Conjunctival injection is moderate or marked. 2. Viral conjunctivitis o Preauricular adenopathy is common in epidemic keratoconjunctivitis and herpes; chemosis is variable. o Discharge amount is moderate, stringy, or sparse; discharge quality is thin and seropurulent. Conjunctival injection is moderate or marked. 3. Chlamydial conjunctivitis tends to be chronic with exacerbation and remission. o Preauricular adenopathy is occasional; chemosis is rare. Discharge amount is minimal; discharge quality is seropurulent. Conjunctival injection is moderate. 4. Allergic conjunctivitis is characterized by acute or subacute onset, no pain, and no exposure history. o Pruritus is extremely common. Clear, watery discharge is typical with or without a moderate amount of mucous production. o An aggressive form of allergic conjunctivitis is vernal conjunctivitis in children and atopic conjunctivitis in adults. Vernal disease often is associated with shield corneal ulcers. Perilimbal accumulation of eosinophils (Horner-Trantas dots) typifies vernal disease. Vernal keratoconjunctivitis (VKC), usually affecting young boys, tends to be bilateral and occurs in warm weather. VKC is presumed to be a hypersensitivity to exogenous antigens and may be associated with or accompanied by keratoconus. 5. Giant papillary conjunctivitis resembles vernal disease. o This condition occurs mainly in contact lens wearers who develop a syndrome of excessive pruritus, mucous production, and increasing intolerance to contact use. o Bilateral disease typically is infectious or allergic. o Unilateral disease suggests toxic, chemical, mechanical, or lacrimal origin. o Intraocular pressure, pupil size, and light response are all normal. o Ciliary flush, corneal staining, and anterior chamber reaction is absent unless a significant amount of keratitis is associated (as seen in EKC). Conjunctivitis usually is diagnosed by history and physical examination. A regular microbiological useful in patients with recurrent conjunctivitis and in some cases of epidemic conjunctivitis the material is obtained by taking conjunctival swabs from lower forniceal and upper tarsal conjunctiva after instilling a topical anesthetic agent (4% lignocaine). Two smears are initially prepared one with gram staining and the other with giemsa. Gram stain is considered the criterion standard for determining the bacterial cause of conjunctivitis. Eosinophils seen on Giemsa stain are indicative of allergic conjunctivitis but can be seen in parasitic causes also. Giemsa staining is also performed to look for the inclusion bodies of Chlamydia trachomatis. Treatment of conjunctivitis is ideally directed at the root cause. Indiscriminate use of topical antibiotics or corticosteroids should be avoided, because antibiotics can induce toxicity and corticosteroids can prolong adenoviral infections and worsen herpes simplex virus infections. A careful counselling of the dosages of the individual medicine should be adequately explained to the patient and an accompanying person so that it will be applied in the right manner. Regular irrigation of the eye with clean water remains the corner stone of the treatment for all forms of conjunctivitis. The following table shows various modalities of management in different types of conjunctivitis. Intensive instillation every 15 to 30 min until symptoms and signs are reduced and gradually tapered.  Advice the patient to clean the eye by washing with normal saline frequently.  Frequent application of preservative free artificial tears.  Topical antibiotics in cases of suspected secondary bacterial infection. presence of membranes and pseudo membranes may necessitate a short course of topical steroids.  Herpetic conjunctivitis to be treated with topical acyclovir eye ointment.  Cold compression and ocular lubricants.  Topical and systemic anti-histaminics.  Oral azithromycin 1g single dose or doxycycline100mgBD for 7 days or tetracycline250mgqid for 7days or erythromycin 500mg qid for 7 days.  I M Spectinomycin 2g single dose.  Use normal saline or cooled boiled water.Initially continuous irrigation will be needed.  Stop instilling the substances that has caused the reaction.  Lubricant ointment can be soothening.  Mild topical antibiotics like chloramphenicol will prevent secondary bacterial infection.  Admit patients if they develop complications secondary to conjunctivitis like orbital cellulitis, keratitis ,scleritis, anterior uveitis ,especially if the patient cannot come for frequent follow up and who are non compliant.  Admit patients with hyperacute bacterial conjunctivitis if the entire cornea cannot be visualized, as there may be an early corneal ulceration. b. Out Patient: All cases of simple conjunctivitis are almost exclusively treated on out patient basis. c. Day Care: Not applicable.  Infants diagnosed to have ophthalmia neonatorum due to gonococci, chlamydia and HSV are referred as they need systemic evaluation and appropriate systemic treatment and more importantly need for counseling the parents.  Severe conjunctivitis, not responding to treatment to be referred for further laboratory evaluation in tertiary centre.  When conjunctivitis appears to be a manifestation of auto immune systemic disease like Reiters ulcerative colitis etc., then patients should be referred for evaluation by an appropriate medical specialist.  Prolonged persistent conjunctivitis with development of complication like cicatrization, lid abnormalities, and dry eye, symblepharon and punctal anomalies.  Severe chemical conjunctivitis with limbal ischaemia and suspected intra ocular penetration of toxic substances to be referred for further management in higher centre. Apart from the regular history taking, care should be exercised to fully understand the treatment history of the patient, including all the medications along with the dosage schedules which were prescribed at the secondary centre. In fact, withdrawal of strong topical antibiotics may be warranted. A fresh comprehensive clinical examination, as detailed in the previous section should be performed without being biased by the referral report. As the patients are referred from a secondary centre for a non responsiveness to treatment or when diagnosis is uncertain or especially in neonatal conjunctivitis which needs exact etiological diagnosis for initiation of treatment , additional micro biological and immunological diagnostic tests may be required.  Culture: Culture and sensitivity of conjunctival scrapings are indicated in all cases of suspected neonatal conjunctivitis, persons who are immunosuppressed, when N gonorrhoeae is under consideration as the etiology, recurrent or severe purulent conjunctivitis and in cases where the conjunctivitis has not responded to medication. When performed, collect exudate from the lower conjunctival fornix with a calcium alginate swab moistened with saline. Sheep blood and mannitol agar plates routinely are used. Expect viral and chlamydial causes in culture-negative conjunctivitis.  Viral diagnostic tests: Viral cultures are not routinely used to establish a diagnosis. A rapid, in-office immunodiagnostic test using antigen detection is available for adenovirus conjunctivitis. Immunodiagnostic tests may be available for other viruses. Polymerase chain reaction (PCR) may be used to detect viral deoxyribonucleic acid. RPS adenodetector is a new rapid diagnostic test for identifying adeno viral conjunctivitis.  Chlamydial diagnostic tests: Suspected cases of adult and neonatal chlamydial conjunctivitis can be confirmed by laboratory testing. Immunologically based diagnostic tests are available, including a direct immunofluorescent antibody test and enzyme-linked immunosorbent assay.  Biopsy: Conjunctival biopsy may be helpful in cases of conjunctivitis unresponsive to therapy. Because such eyes may harbor a neoplasm, directed biopsy may be both vision-saving and lifesaving. Conjunctival biopsy and immunofluorescent staining diagnostic tests may be helpful to establish the diagnosis of diseases such as ocular squamous surface neoplasia (OSSN), ocular mucous membrane pemphigoid (OMMP) and paraneoplastic syndromes.A biopsy of bulbar conjunctiva should be performed and a sample should be taken from an uninvolved area adjacent to the limbus in an eye with active inflammation when OMMP is suspected. In cases of suspected sebaceous gland carcinoma, a full-thickness lid biopsy is indicated. When considering a biopsy, a preoperative consultation with the pathologist is advised to ensure proper handling and staining of specimens. c) Treatment: The treatment strategies should be revisited to check for adequacy, appropriateness and affordability. If the culture and other tests show a different organism, then the treatment regimen should be modified. 1. Symblepharon: treated by dividing the symblepharon and to prevent the reformation of scar tissue during healing period. The formation of scar tissue in raw area is prevented by single pedicle conjunctival graft, mucous membrane graft, split skin graft or by amniotic membrane transplantation. 2. Correction of lid abnormality like cicatricial ectropion, cicatricial entropion, trichiasis etc., by appropriate surgical procedure. 3. Chemical conjunctivitis with severe ocular surface abnormality treated by ocular surface reconstruction by limbal stem cell graft, conjunctival autograts, fornix reconstruction, optical penetrating keratoplasty and keratoprosthesis surgeries.  Infants diagnosed to have ophthalmia neonatorum due to gonococci chlamydia and HSV are admitted as they need systemic evaluation and appropriate systemic treatment.  Prolonged persistent conjunctivitis with development of complication like cicatrization, lid abnormalities, dry eye, symblepharon and punctal anomalies.  Severe chemical conjunctivitis with limbal ischaemia and suspected intra ocular penetration of toxic substances. b. Out Patient: If the patient requires only modification of the topical anti-infectives, then he/she can be treated as an outpatient. d) Referral criteria: not applicable.  Plan treatment guidelines and perform surgery if necessary. Monitoring, publication and reporting to department of health if there is an epidemic conjunctivitis and if there is an emergence of drug resistance pathogen.  He/she plays a critical role in breaking the chain of transmission of epidemic adenoviral conjunctivitis, primarily by educating the patient and family about proper hygiene.  He/she should also ensure that needy patients receive necessary care directly or through referral to appropriate persons and facilities that will provide such care, and he or she supports activities that promote health and prevent disease.  Prepare Slide, Media for smear and culture.  To monitor the patients who are admitted.  To maintain separate inpatient and outpatient record.  To maintain lab reports. 5) Anti allergic eye drops. 4) Chlamydial diagnostic tests like IF tests,ELISA. Conjunctivitis is not to be treated at PRIMARY LEVEL???? Have we that much manpower?? ?